Tips: How Can I Tell If a Costume Is Authentic or From a Movie? 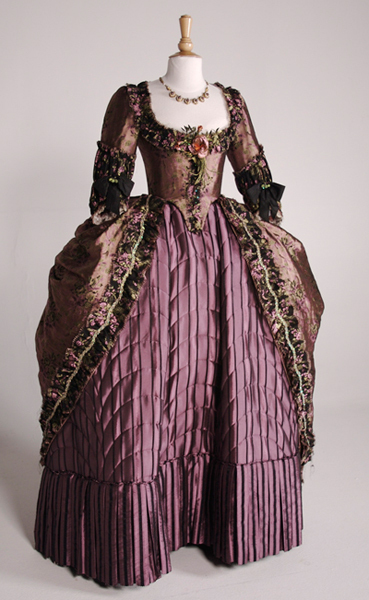 Sometimes, people will show us a picture they’ve found online and ask “is this really historical or is it a costume from a movie?” Similarly, we’ll see images of historically styled garments (often on Pinterest) labeled as “18th century” or some other specific era, and we’ll ask, hmmm … is that authentic or from a historical costume movie or TV show? Here are a few ways to find out. Find something on Twitter, Pinterest, or Tumblr? Follow it back to the source. 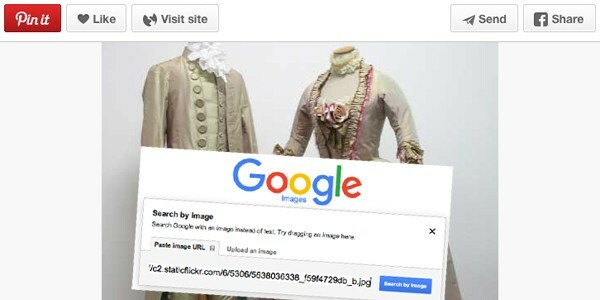 Images that are re-blogged may still be linked to their original museum source, if it’s a historical image, or movie auction catalog, for a film costume. This is not foolproof by any means, but give it a shot. Where is this from? Have we seen this before? Maybe on a certain clompy actress? Get the source URL of where the image is hosted. Usually, you can right-click (on a one-button mouse, click and hold) on the image to “copy image location” to your computer’s clipboard. Next, go to images.google.com and click on the camera icon in the search box. 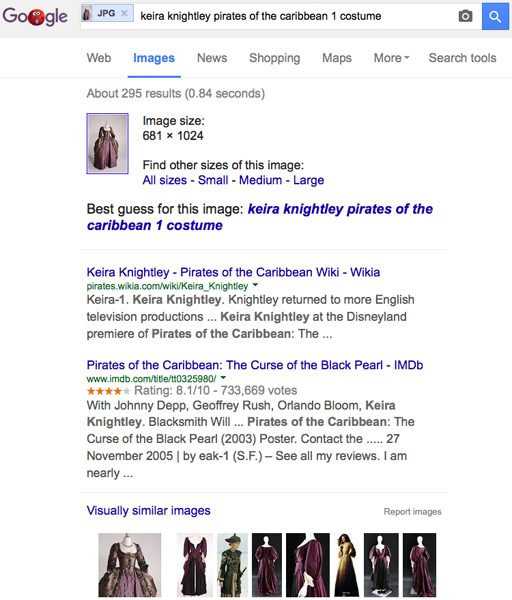 Google says this dress was worn by Keira Knightley in Pirates of the Caribbean, but if you click through some of the results, you’ll see it was The Duchess. 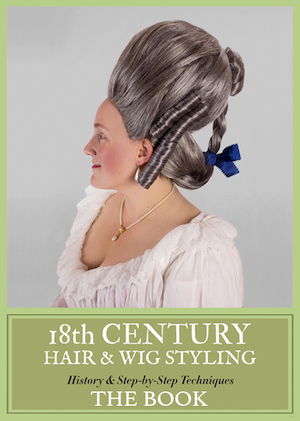 Still, it’s not authentic 18th century. Now, these won’t always be perfect, and you will have to sort through the results. But we find that about 75% of the time, this will identify whether an image is of an extant historical item from a museum or a costume from a movie or TV show. The information displayed on the first page of search results should be a very strong indicator as to if the image is historical or a movie/TV costume. You can also upload the image into Google Image Search, but this can produce not quite as accurate results. The URL is more helpful because it contains information that Google can use, in addition to matching the graphic. If this isn’t conclusive, you’ll have to do more sleuthing. You may want to compare the image to both historical portraits from the period (Wikimedia Commons has artwork sorted by century), or if you have an idea it’s from a film, check IMDB since films may have photos directly available on the title’s page. Historical periods vary, so it’s difficult to generalize. Ideally, you’d find the image source to be sure. What other tips do you have for telling if a costume is authentic or from a movie or TV show? Tips: Where Can I Watch That Historical Costume Movie? Usually, one of the biggest dead give-aways that a costume isn’t historical, but a movie costume, is the color and color combinations. That dress from The Duchess is a good example… It looks *close*, in terms of fit and proportions. But the colors are all wrong for the 18th-century. Historical color combos, while they can be garish and clashy to the modern eye, typically have a brightness to them that modern movie repros lack, favoring a more “tarnished” palette, probably to evoke “Ye Olde Timey-ness”. Also, the petticoat is quilted (period) but it’s abstract (not period). Also, the vertical pleats all over the petticoat… Not something seen much in the 18th-century, and even then, not *all over the petticoat*. The emphasis in this era was on the horizontal, particularly with petticoats. And again, trimmings were pretty much focalized in the front of the petticoat, where the overgown splits over it. An all-over embellishment is rare. Not saying it didn’t happen, but it certainly wasn’t the norm. A very useful article. Always good to have sources. My only tip is do exactly what this post starts off describing — ask around / crowd-source an answer. Talk to trusted experts, post to the relevant Facebook groups (although I know what a quagmire that can be), etc.